Anyone can provide an answer to a question. Finding someone that can propose the correct solution using innovative means and the latest technology at an affordable price takes talent. Let our staff of knowledgeable professionals help you to find cost effective answers for your industrial hygiene, occupational safety and emergency preparedness issues. Are you sure you will be ready if your hospital is called upon in the event of a hazardous materials emergency in your own facility or in the surrounding community? Do you understand the OSHA requirements for training your employees? Do you understand the latest JCAHO standards for hazardous materials management and emergency response? This seminar will provide you with the answers to these questions and the tools to effectively implement your hazardous materials programs. Recent research has shown that most health care organizations providing acute care services are not adequately prepared. They have not put into operation many of the basic essentials for dealing with a hazardous materials incident. Not being prepared can lead to serious consequences. Your community expects that you will be prepared. Learn what actions are necessary to protect your employees and facilities. Any health care professionals involved in hazardous materials and emergency response should attend. $169 single registrant ($149 for 2-4 and $129 for 5 or more). Contact us for the latest schedule or information on an in-house presentation of this program. This one-day course is specifically designed to meet the minimum training required for healthcare (e.g. hospital emergency room, etc.) personnel assigned to participate as a member of a patient decontamination team for victims who may be contaminated as they come in for medical assistance. The class teaches the basics of Operations level (defensive) response from the healthcare viewpoint. Courses are also offered at client facilities for groups of 10 or more. A one-half day workshop to review the changes in the OSHA record keeping standard effective January 2002. Still having trouble with the new record keeping standard? Have you seen the latest OSHA interpretations? How does this apply to the healthcare industry? This course is designed to help you answer these questions and show you how to effectively implement the new standard. Available in the morning or afternoon of each day. $89 single registrant ($79 for 2-4 and $69 for 5 or more). Contact us for in-house group rates. Asbestos- This course addresses the requirements of OSHA regulations. By taking this course you will know the nature of asbestos, and know the responsibilities of those whose job places them into proximity of asbestos. Bloodborne pathogens- This training module is designed to provide a basic understanding of bloodborne pathogens, common modes of their transmission, methods of prevention, and other pertinent information. Confined space entry/rescue- HSS provides classroom instruction for employees whose duties require them to be involved in confined space entry. This program is designed to satisfy, in whole or in part, the training requirements of 29 CFR 1910.146. Ergonomics- This site-specific training session is designed to help educate your staff on the basic concepts of ergonomics and how to best improve work operations that may be physically-demanding/repetitive in nature. Fire extinguisher use- Our training session will help meet Federal Regulations that require employers who provide portable fire extinguishers in the workplace to also provide training for their use. Hazard communication- This training is designed to meet the Hazard Communication rule requirements for training employees who may be exposed to hazardous chemicals at their jobs. Contents of the training are based on OSHA requirements. Laser Safety- This one-day introductory level course covers laser safety requirements in the most common type of laser environments. The course will provide an introduction to laser safety at an entry-level basis. Lead- Our class includes: introduction to the history of lead, how lead is used, the health effects of lead poisoning, lead regulations, hazard recognition and control, medical surveillance, medical removal, personal protective measures, respirators, clothing and hygiene, work practices during abatement. Lockout/tagout- HSS provides training to help ensure that the purpose and function of the energy control program are understood by employees, and that the knowledge and skills required for the safe application, usage, and removal of the energy controls are also acquired. Mold- Designed for the facilities and housing industries to familiarize attendees with current issues in mold hazard control. Training focuses on the what, where, when and how associated with the identification and control of mold. Respiratory protection- This respiratory protection program is established to coordinate the use and maintenance of respiratory protective equipment when such equipment is used to reduce employee exposure to potentially hazardous agents or work environments. Workplace violence prevention- Our workshop is designed to provide managers and individual contributors with the necessary skills to identify, prevent, minimize and eliminate aggressive and violent behaviors in the workplace. Need help understanding the newest OSHA policies? Let Health Systems Safety, Inc. help you set the records straight! Our course will help you understand the nature of asbestos, as well as explain the responsibilities of those working near it. 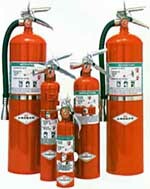 Let us help explain how to chose the right fire extinguisher for your company and train your employees on how to use them correctly. Let us educate you and your staff on the current issues of mold hazard control. If you would like to contact us for more information or you have any questions about any of our programs, please feel free to do so. We would love to help tailor our progams to fit your unique needs so you provide the best service you can to your community!